NMIMS NPAT 2019: NMIMS NPAT is an acronym for NMIMS Programs After Twelfth. It is a National level entrance exam conducted by the Narsee Monjee Institute of Management Studies. The Exam offers admission in the Undergraduate and integrated degree programs in the school of NMIMS campuses located at Mumbai Shirpur, Bengaluru, Indore and Navi Mumbai. 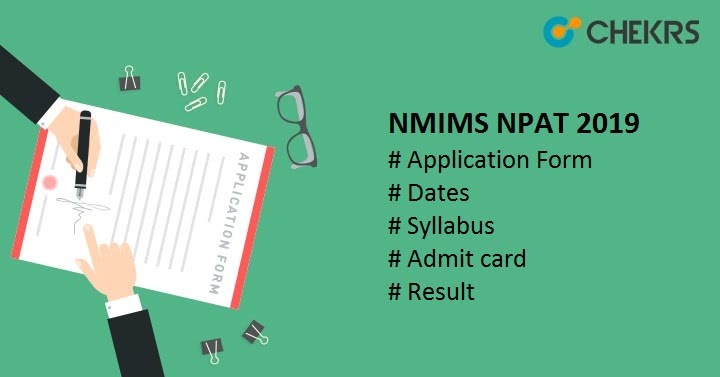 Latest Update: NMIMS NPAT 2019 Application Forms are available from 25th January. Check the eligibility and fill the application form. 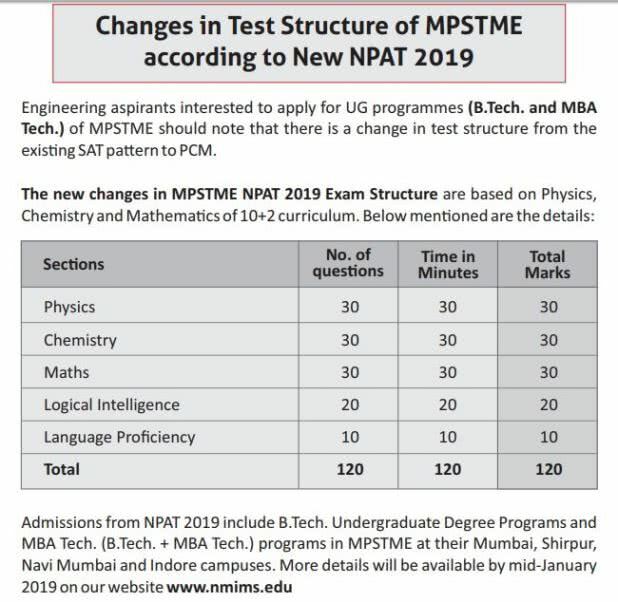 Latest Update 25th January: NMIMS NPAT 2019 Exam Pattern for Engineering has been Changed. Check the details below. Latest Update 25th January: NMIMS NPAT 2019 Notification Released!! NMIMS NPAT provides admission into various fields like Management, Engineering, Pharmacy, Architecture, Commerce, Economics, Law, Science, Liberal Arts, Design, Aviation, etc. NMIMS NPAT Admission will be done on the basis of score, Performance in Counselling. In this article we are providing all the information needs to Appear in this examination, but you have to do the hardest work: preparation for the exam. Through NMIMS candidates can get admission in various field in the various course. The list is given below. NMIMS NPAT normally conducts in mid of the year. The tentative dates for all the events are provided here. This table with NMIMS NPAT 2019 Dates (tentative) will help you to be ready for the upcoming events of the exam. 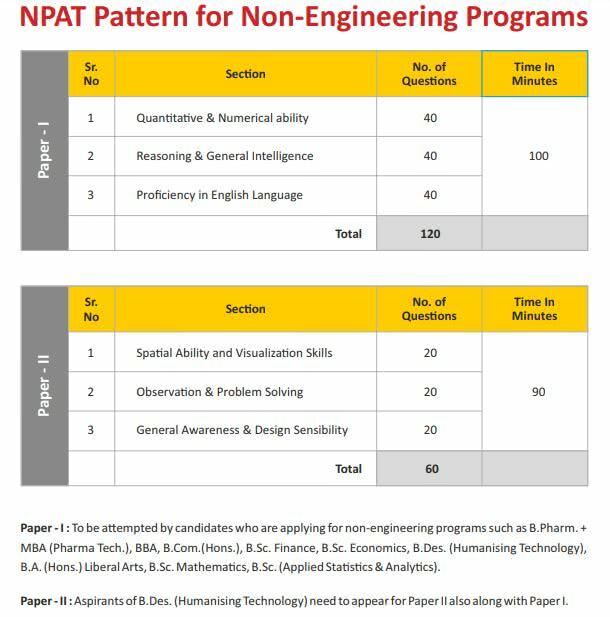 To fill out the application and appear in the exam without any problem candidates must check their eligibility for the NMIMS NPAT. We are here providing some of the NMIMS NPAT Eligibility Criteria here. Must check before applying for the NMIMS NPAT 2019.
International Baccalaureate Diploma with English and Science subjects. Minimum of 45% marks for Shirpur campus. Having IB diploma & Mathematics at 10+2 are eligible. Must be passed or appearing 10+2 or equivalent exam along with +International Baccalaureate diploma and in one attempt only are eligible. Minimum of 50% aggregate marks for B.Com and 60% for B.Sc Finance and BBA in qualifying exams required. Passed or appearing 12th or its equivalent examination including +International Baccalaureate diploma with science stream (PCM/ PCB) & +English as the compulsory subject. The Application form will be available through online mode only so candidates have to visit the official website and fill the application form. The NMIMS NPAT 2019 Application Form will be available from the first week of February 2019. There will be application correction facility also for all the applicants available on the website. Candidates have to first visit the official website and Register there. Now after registration, Login to the site and fill the application form by providing the Personal, Academic and contact details. After it uploads the scanned images. And take a printout of the filled and ready to submission form. Now pay the Application fee through the available mode of payments. NMIMS NPAT Application Fee will depend on the number of school candidates choose for admission. The List of the fee is provided here. We are also providing NMIMS NPAT 2019 Exam Pattern here. It will help you to manage time and practice for the examination. NMIMS NPAT 2019 Exam Pattern and Syllabus for Non- Engg. The NMIMS NPAT Syllabus will cover topics Like English Language, Quantitative & Numerical Ability and Reasoning and General Intelligence, reading comprehension, grammar, vocabulary, Logical Reasoning & General Intelligence of visual aptitude, coding and decoding, series, and arranging puzzles, Quantitative & Numerical Ability section including basic questions of Average, Probability, Profit and Loss, Areas, Series, Mixture, Decimal Fractions, etc. Always prefer the good study materials. Solve NMIMS NPAT Previous Year Question Paper for getting the idea of the paper pattern and format. Admit Card will be available in the 2nd week of May 2019. It will be released through the online mode on the official website. Candidates need to download the NMIMS 2019 Hall Ticket to appear in the examination. Candidates also have to affix Photographs on the Admit card. Candidates have to bring the Admit card with a Photo ID to the examination center. The result is expected to be released in the 4th or Last week of May 2019. The result will be uploaded on the Official website. Candidates need to download the NMIMS NPAT 2019 Result and search for their Roll Number to know the result. The Exam Authority will also prepare and release NMIMS NPAT Merit List, Call Letter & Admission Letter for various courses. The candidate has to visit the official website to download the documents and appear in counselling if qualified. Counselling or selection will be conducted through offline mode and candidates have to present in person to participate in the Counseling/ Selection Process. NMIMS NPAT Counselling for B.Tech and MBA (Tech) will be conducted in Mumbai campus. To Appear in the Counselling process candidate must have to carry admission letter and required documents to the counselling center. In the Counselling, process candidates have to select a course and college in which they want to get admission. After it, Seat will be allotted on the basis of Score in Exam, Category, reservation, Seat availability and the document verification.